FILE - Protesters in Jakarta rally in Feb. 2015 in support of General Budi Gunawan as national police chief, despite allegations of corruption. Indonesian bureaucrats are holding off spending billions of dollars on everything from schools and clinics to garbage trucks and parking meters, fearful that any major expenditure could come under the scanner of fervent anti-corruption fighters. 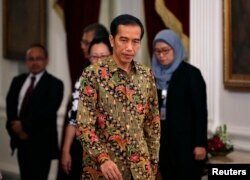 The paralysis is so bad that President Joko Widodo, desperate to pull Southeast Asia's largest economy out of a slump, is considering a decree that would shield civil servants from graft busters until big-ticket projects are completed. "There are concerns of criminalization," Boediarso Teguh Widodo, the finance ministry's director general of regional budgetary spending, told Reuters. "In order to overcome this issue, the government has been asking relevant agencies 'to calm down' and not investigate until projects are finished." The official is not related to the president. Similar problems are playing out in China, Indonesia's top trading partner, where an unprecedented clampdown on graft has hamstrung investment and state spending. But in Indonesia, which consistently ranks among the world's most corrupt countries, it appears to be a lose-lose situation. Economic growth, already under pressure because of weak commodity prices, is not getting the lift it needs from public expenditure because bureaucrats are afraid to make decisions. But the drive to root out corruption itself has had scant success since Widodo came to office just over a year ago. In recent months, the police and the Attorney General's Office (AGO) have moved into the territory of the Corruption Eradication Commission (KPK), which was weakened by attacks from rival law enforcement agencies, parliament and Widodo's own political party. The police and the AGO are seen as quick to round up suspected offenders and usually cast a wide net. Although there have been few prosecutions, this has had a chilling effect on bureaucrats, who fear being caught up in investigations. In a recent high-profile case brought by the AGO, two Jakarta transport officials were jailed after their boss was arrested for taking bribes in public bus tenders. "We are afraid if the boss gets in trouble, all of the staff below will be sucked in," said Heru Budi Hartono, head of Jakarta's financial and asset management board, which handles spending for the city government. "All of our staff are very careful and afraid," he added. "Even the police chief has told us to go ahead [and spend], but we are still going carefully." To avoid "aggressive" investigators, some bureaucrats will block the paperwork needed to approve funding. In Jakarta, a multimillion-dollar contract to build dozens of schools was postponed until next year because of "administrative issues," according to Hartono. The AGO denies there is a turf war with other investigating agencies, but conceded that there were problems with its approach to quashing corruption. "We realize our handling [of such cases] can be improved," said a spokesman for the AGO. "We don't intend to criminalize. We only want to follow the law." Few major corruption arrests have been made by the AGO or the police this year. By contrast, the KPK's biggest catches were three cabinet ministers of the previous administration and the chief of the constitutional court, all of whom were charged in cases ranging from bribery to marking up government procurement contracts. Widodo, who has made reviving economic growth his top priority, is banking on public spending to build the power plants, seaports and roads needed to attract much-needed investment. But spending delays due to red tape and policy disarray within his cabinet have stood in his way. The economy expanded by an annual 4.73 percent in the third quarter, slightly faster than in previous quarters, but not enough to suggest a real turnaround. The government has said growth this year will be the slowest since 4.6 percent in 2009. In Jakarta, only 40 percent of the city's 2015 budget of nearly $50 billion had been spent as of November, raising concerns about the progress of much-needed infrastructure projects in the gridlocked capital of 10 million people. Jakarta officials expect as little as half of the budget will be spent this year, with the rest being carried into 2016. "If you want to build Jakarta, we have to do it together. If something goes wrong, please report it immediately and give some advice so nobody needs to go to jail," Hartono said.